She sat down next to me on the bench, and out of nowhere began to share her story. The line that stuck out to me was…“it was a blessing in disguise”. She had lost everything including her home in a tornado. Yet, she could say it was still a blessing. She was demonstrating an incredible attitude to me, a stranger. I was no one she needed to impress, I was not someone in her circle of influence, and I was probably not going to be someone she ever saw again. I know her first name and really not much else, but in just those few minutes I spent with her she inspired me. She was being an every day leader by her contagious attitude about life. I didn’t know what she did for a living, I didn’t know her family background, her beliefs, or her history, but what I learned in that short conversation had an impact on me that will last the rest of my life. I was reminded that our attitude is contagious. She turned a difficult situation into a positive one and shared it with me. I want to model that attitude. This encounter was a great reminder to me that our attitudes play a huge role even in the most unexpected places! I am amazed at the influence we can have on people we don’t even know. We each have the ability to be someone of influence and that influence can be positive or negative…our attitude can be contagious! YOU are that every day leader! How easy is it for us as people to go about our every day lives, doing our own thing, keeping to ourselves and not even noticing others or taking the time to speak to those around us. How many times have we been at a coffee shop sitting outside and not even say hello to those walking right past us? Perhaps we never even noticed them. Think about all the opportunities we have each day to influence others – often times it can be as simple as the attitude we demonstrate or in how we react to our own circumstances. We model to others by how we live our own lives. What are you modeling? What are others seeing? Do they see someone who sees the good in life…the blessings in disguise? Or do they see someone who complains, wonders where the good is and who struggles with life issues? Modeling a good attitude takes work and LOTS OF PRACTICE. As every day leaders we must be intentional to model an attitude that is positive and contagious to those around us. Doing this does not come naturally! Your attitude does impact those around you…even a stranger. Just like Diane sharing her story reminding me about blessings in disguise, I want to be intentional in my attitude, making a difference in the lives of others. An Every Day Leader, Living an intentional life. Making a difference with my attitude. 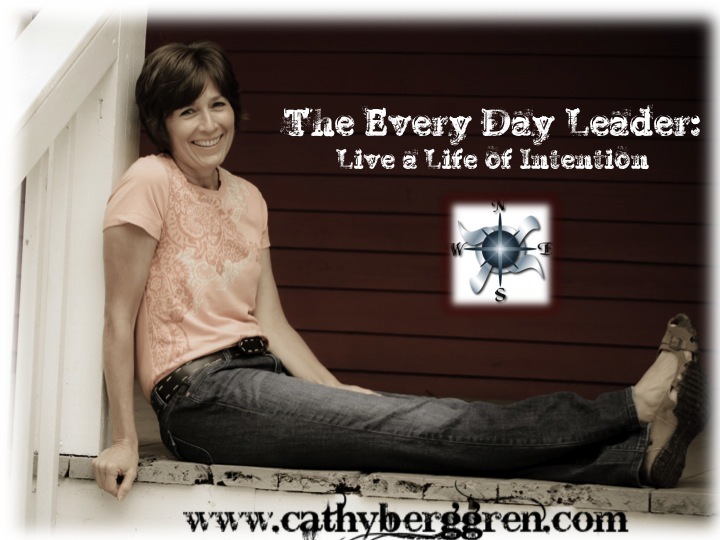 This entry was posted in leadership and tagged attitutde, bench, Cathy Berggren, contagious, every day, Every Day Leader, leadersihp, stranger, tornado by Cathy Berggren. Bookmark the permalink. Yes attitude can be contagious for bad or good that is why it is vital that we as leaders intentionally choose to be positive because it will be picked up by those around us. Thanks for reading the blog, please visit us again soon. It’s great to see someone with the ability to reach others in the business world so willing to proclaim their Faith. Your comment “our attitude is contagious” can be a double edge sword. I’ve had several opportunities to see negative attitudes all but destroy in a hour, a vision that may have taken weeks or months to nurture. I haven’t had a chance to read any of your other blogs, but I’m hoping to find something that addresses not only the effectiveness of positve attitude and speech, but also the impact of body language on those around us? True happiness does not come from external circumstances. Life in and of itself is a roller coaster of huge highs and very low lows. People will come into our lives who have authority and will do things that we do not agree with but they do not dictate our attitude. Only we can dictate our attitude. Only you can allow someone to trample you and your feelings, treat you like dirt, or bring joy beyond belief. You control those boundaries. Yes, these are difficult times both politically and economically but my source of strength and the one that I tap into for a power source is my Lord and Savior. Everything pales in comparison to what Christ did for me. And that is why I can be happy and that is why I can be positive when external circumstances are not. I intentionally choose to live my life that way. Its not easy, but it so worth it. May you also reflect that positive attitude to those you encounter. Cathy, how can you be positive, when it isn’t practical? When you are trying to inform about pending laws that need to be addressed; when day after day our leaders disappoint us by making decisions, our hurrying to a decision when they know if they wait their pet project would not pass? Having a positive attitude precludes trust and our political leaders haven’t been honest, trustworthy leaders in years, if at all. What if the very nature of being a political leader is negative and the proper response is negative to bring in a new batch who will take some time to be corrupted?